It’s been a while since I wrote a Junos post… there are a few things that I’ve been meaning to write up for a while, so this series will focus on MPLS label switched paths (LSP) and how to put traffic on to an LSP. By default IGPs won’t use an LSP, so this 1st part focuses on what you’ll need to configure should you want both BGP and IGP traffic forwarding to use LSPs. Later parts will look at other options available in Junos to forward traffic via an LSP, and more advanced topics e.g. LSP selection based on BGP extended community. Table inet.0 is the primary unicast routing table used by IPv4. It’s where IGPs will resolve next hops. Table inet.3 is the routing table populated by MPLS protocols such as RSVP or LDP. A lookup here will result in a label being pushed. It’s also worth noting that inet.3 is used by BGP to resolve BGP next-hops. BGP examines both inet.3 and inet.0, choosing a next-hop based on the lowest Junos preference value. In case of a tie, inet.3 is used. This is the MPLS label switching table and is used by label switch routers. Routers along the LSP will use this table to swap and pop labels as appropriate. The base configurations are using OSPF as the routing protocol and LDP to exchange transport labels. Let’s have a look at Junos1 and R4 and see how traffic would be forwarded by default. Table inet.0 contains only the OSPF leant route. Remember that although there is a LDP route in table inet.3, it won’t be used for IGP route lookups, and we can verify this with a look at the forwarding table for prefix 102.102.102.102. Note that type is “ucst”, if the traffic was to be labelled it would say “Push” followed by the label number to be pushed. Therefore IPv4 unicast traffic by default on Junos will not be labelled. R4 shows a very different story – traffic will be labelled, and will push label 29. Also note that R4 expects labelled traffic going to 102.102.102.102 to be received with label 28. Well that’s pretty clear that the 1st hop traffic from Junos was not labelled, and traffic from the IOS box R4 was labelled. The egress label applied for the R4->R3 traffic was label 29 as expected. So what if we want Junos to forward IGP traffic via an LSP? Well there are a couple of MPLS configuration options: traffic-engineering bgp-igp and mpls-forwarding. Traffic-engineering bgp-igp configures BGP and the IGPs to use LSPs for forwarding traffic destined for egress routers. The bgp-igp option causes all inet.3 routes to be moved to the inet.0 routing table. 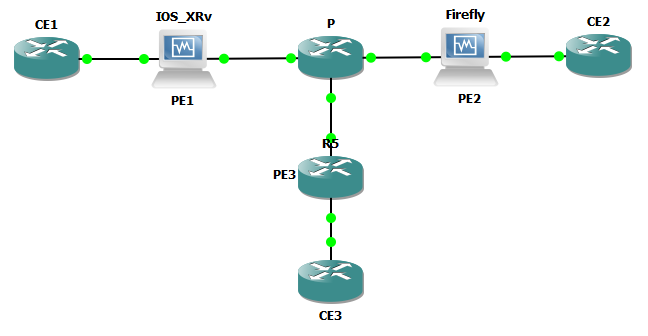 The LDP route and the OSPF route are now in table inet.0, and the LDP route with preference 9 is now the best route. Spot on – and the 1st hop label is 28, as expected. traffic-engineering bgp-igp will allow high-priority LSPs to supersede IGP routes in the inet.0 routing table. Essentially this means that the active route might not be the IGP route, and therefore IGP routing might not be as expected, e.g. routing policy routes may not be matched. The mpls-forwarding option enables LSPs to be used for forwarding but not route selection. Routes are added to both the inet.0 and inet.3 routing tables. Note that both the OSPF routes and the LDP routes a present in table inet.0 but the OSPF route is marked “Routing Use Only” and the LDP route “Forwarding Use Only”. The difference can be noted when we are matching against a protocol in a routing policy. In the second part in this series, I will look at BGP forwarding via an LSP, and will also demonstrate how these two MPLS options affect route redistribution from OSPF to BGP.